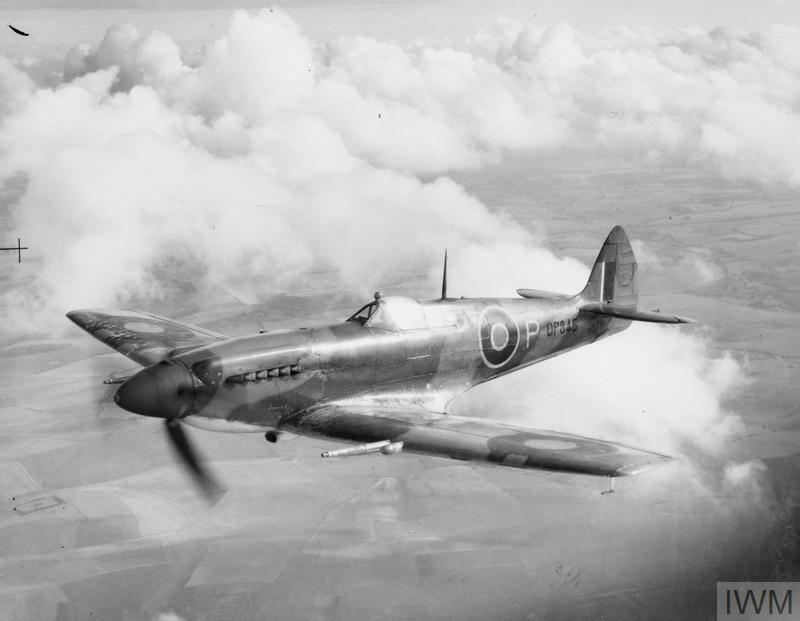 By way of relief from the old original pressure-cabin types of the Mark VI and VII, the Mark XI PRU Spitfire was quite the simplest and most easy-going affair designed for medium-high altitude work and high speed. There was no pressure-cabin and, most delightful of all, no gunsight to restrict one’s forward view. In place of the bullet-proof screen was a pleasant one-piece moulding which, with the canopy, gave an unrestricted view of the entire upper hemisphere. The Mark XI was also lightened considerably by the absence of guns. However there were two extra wing tanks well outboard, the contents of which were indicated on two extraordinary gauges – which always seemed to indicate the same amount whether the tanks were empty or full. The only practical solution was to run each of them dry in turn. Then at least you knew where you were. 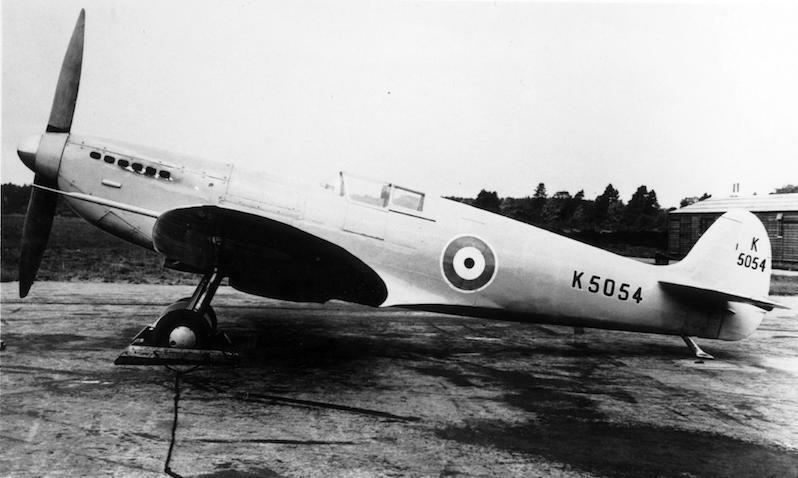 The first of the Griffon-engined Spitfires, the Mark XII, seemed to behave simply as a Mark V with more power and a torque-swing in the opposite direction (i.e. to the right). At first, when flying these later Marks, it took something of an effort of memory to set the rudder bias correctly – although nothing very terrible happened if you forgot, except to the muscles of your left leg! 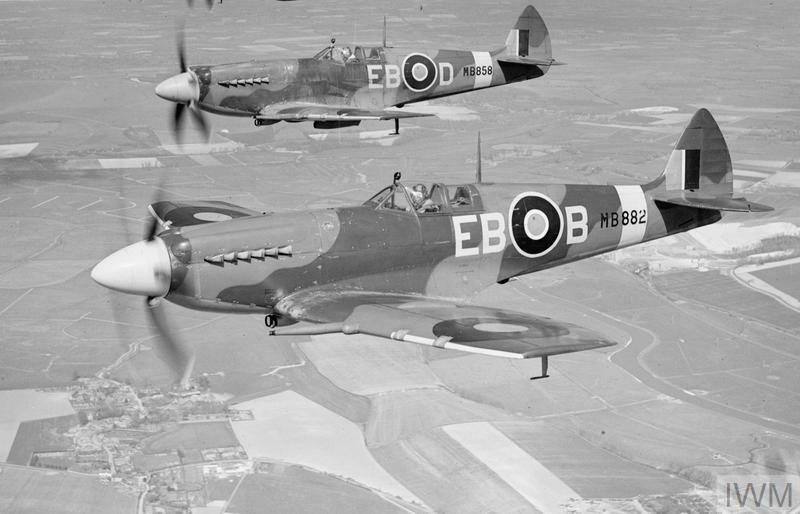 And, recalling the ‘good old days’ of the Mk.II, we had to re-accustom ourselves to the cartridge-starting procedure with the Griffon Spitfires. But the XII had a new and rather special noise which we quickly learned to like as more and more XIIs and XIVs came into the market. And although the actual stalling speed, even at the greater all-up weight, appeared to be virtually unchanged, the XII and later Griffon Marks had a pleasant way of staying much more firmly on the ground after touchdown in rough conditions. 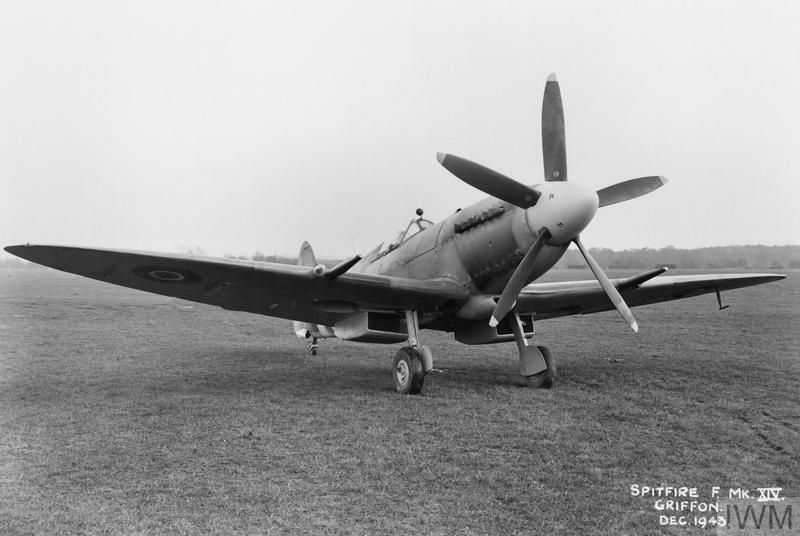 With the Spitfire, lateral trim always provided some interesting little problems. In the early days of fabric-covered ailerons the usual ‘cording’ method^ was used and then, when the change-over to metal surfaces came, the trailing edge used to be reflexed sharply to produce much the same results. ^airscape Note: Literally attaching cord to the aileron trailing edge to create a sharper angle. Still later, it became customary to obtain even, or nicely averaged, lateral trim by the cleaner and more civilised expedient of ‘dressing’ or ‘planishing’ the aileron trailing edges over the whole length, using a wooden mallet and a supporting block. Excellent in theory though this might be, the fact remains that, for one reason or another, only adjustments to the inner foot or two of aileron edge usually produced any marked effect on the trim, and it was sometimes necessary to ‘dress’ the edge almost to the extent of using the much-despised reflex method. Needless to say, different test pilots’ equally different methods of indicating trimming defects could cause a good deal of doubt and despondency on the ground. Some, in their reports, wrote in terms of ‘inches’ of lateral trim defect, and others in still more mysterious ‘degrees’, while all had their own particular standards of measurement in the different universes of their own imaginations. It was a good rigger who could translate the trimming requests of two or three different pilots, each speaking a different ‘language’, with any real accuracy. 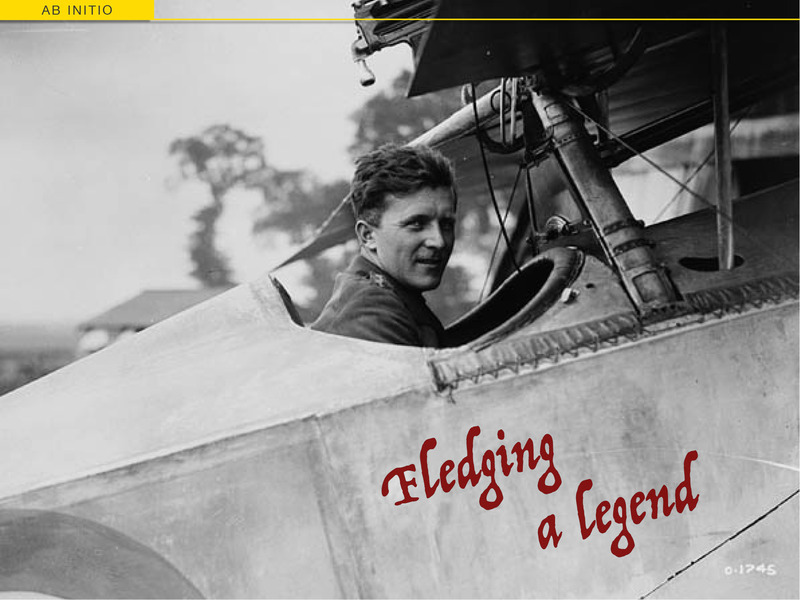 The ‘inches’ were, in fact, a relic of the days when we either laid lengths of cord on the aileron’s upper trailing edge, or bent the edge sharply along so many inches of span. The measurement by the ‘degree’ system – the ingenious idea, I believe, of a certain Maintenance Unit test pilot, and applicable only to one or two types – was even more mysterious to the uninitiated, although it was really very simple. When a particular aircraft was, say, tending to roll to the left, one merely trimmed this tendency out on the rudder bias until, by virtue of various complicated aerodynamic forces, the aircraft would fly level while, of course, skidding quietly along to the left. The top needle of the Watney, Combe and Reid showed the amount of this skid, and there you were. airscape Note: This was, of course, the Turn & Slip indicator. The reference to Watney et al, a very popular brewery, probably comes from RAF personnel’s own tendency to ‘turn and slip’ after a few too many in the local pub. This measured skid amount varied in complicated proportion to the amount by which the aircraft would normally, when properly trimmed directionally and left to itself, have been trying to roll. It was a quite mechanically standard method of indicating the amount of lateral trim error, and all pilots would produce the same answer for the same aircraft at the same speed. Unfortunately, however, four degrees of indicated skid, say, were by no means the same as twice two degrees of skid when translated into lateral trim terms. The unfortunate rigger had to think that one out, and he very quickly learned to do so. There were, occasionally, those awful moments when an aircraft off the production line would want to roll strongly one way while already having a near-limit up float tendency on the opposite aileron. Obviously, it was impossible to dress the aileron to correct the trim without further increasing this up float. Results could sometimes be obtained by a judicious hammering of the shrouds, but it usually meant a complete aileron change and sometimes even a complete wing change. One of the more mysterious troubles with which aircraft are sometimes beset appeared with a particular XII which had already done quite a good deal of flying. This aircraft developed a power-surging tendency which was tantamount to a series of dead cuts—and always at high speeds. The constant-speed unit was at first suspected, and hopes of a cure were high when the inside of the mechanism was discovered to be both worn and very dirty. But the surging continued. In turn the c.s.u., the airscrew, and even the carburettor were changed, with no perceptible result. Only a long series of very earnest diving tests at different boosts and constant speed settings finally revealed the definite fact that the violence of the surging increased primarily with speed – 320 mph appeared to be the critical ‘starting’ speed – and, to a lesser degree, with variations in revolutions and boost. Obviously, therefore, the trouble was bound up with some variation in ram effect, and it was eventually discovered that, due to a manufacturing fault, the shape of the air intake was being changed by the increasing air pressure. It was not actually closing up, so much as distorting, and neither the boost control nor the c.s.u. could cope with the violent alternations in outer intake pressures. 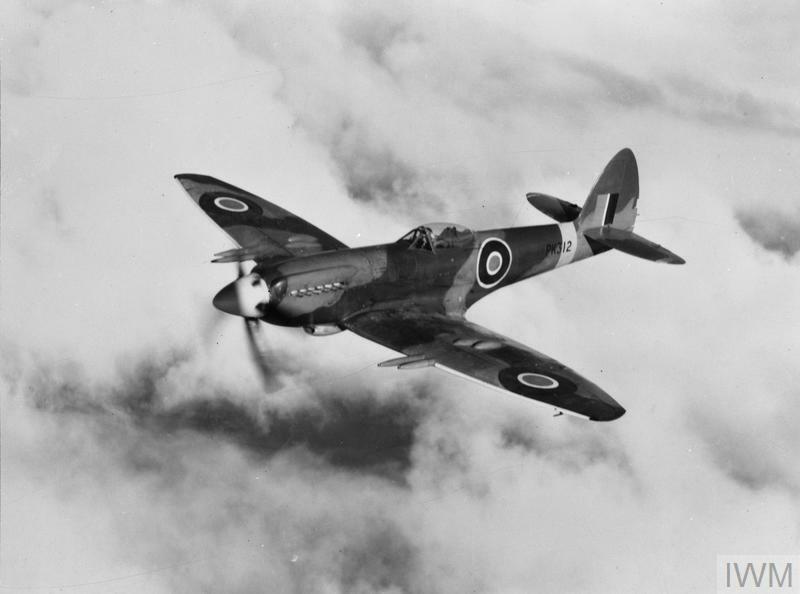 Some characteristics of the later Spitfires, and of the Mark XIV in particular, were given in a separate article (see airscape Flying the Fourteen), but there was one difficulty which came to something of a climax in testing later versions of this type. Although earlier Marks had been fitted with what were known as ‘interconnected’ or ‘automatic’ engine controls, the boost-revolution situation could sometimes be quite remarkably acute when making adjustments to the XIV. No very useful checks could be made during the ground run because the c.s.u. never had a chance to take the blades off their stops, except at boost levels not permitted on the ground. During run-up the boost was always ‘ahead’ of the revolutions, the airscrew was always in fine pitch, and one never knew whether the c.s.u. was functioning properly – let alone whether the ‘interconnected’ and ‘stop’ settings were actually correct. All this was managed by the two constant speed stops (‘automatic’ and ‘override’) and one setting for minimum revolutions, as well as a couple of control rods on which intermediate adjustments could be made. There were also boost capsule adjustments and stops in the throttle gate – a movement on any of which could change the relationship between power and revolutions. Certain tolerances were permitted and the fitter had to strike a nice average, using boost and interconnection adjustments in unison, to obtain all-round results with both boost settings and revolution readings within their allowable ranges. And yet in spite of all this complexity, with an expert in attendance, it was only necessary to bring back a series of complicated and apparently uncoordinated figures for immediate and correct results to be obtained on the next flight. One should, of course, include the Seafire variants amongst all the rest. 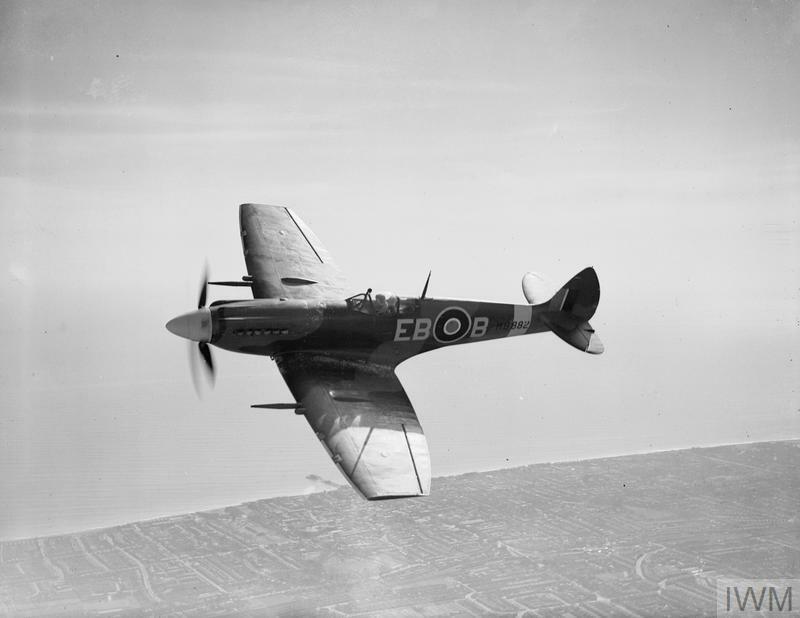 The Seafire Mark III, in particular, was remembered for its light, almost over-light, aileron control, while the Mark XV was almost entirely similar to the XII. 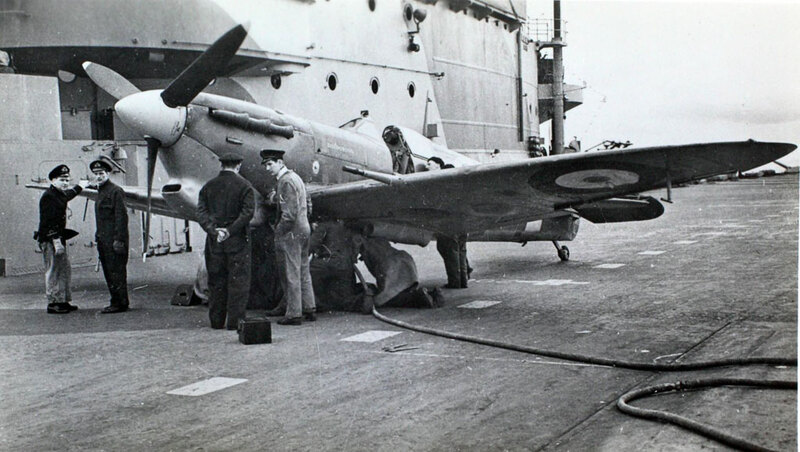 We liked the Seafire III rather specially, not only because it handled so nicely, but also because later, when nearly all Spitfires were fitted with gigantic gyro gun-sights, the Seafire was still fitted with the old-fashioned reflector sight. And it had no interconnected controls to worry about. 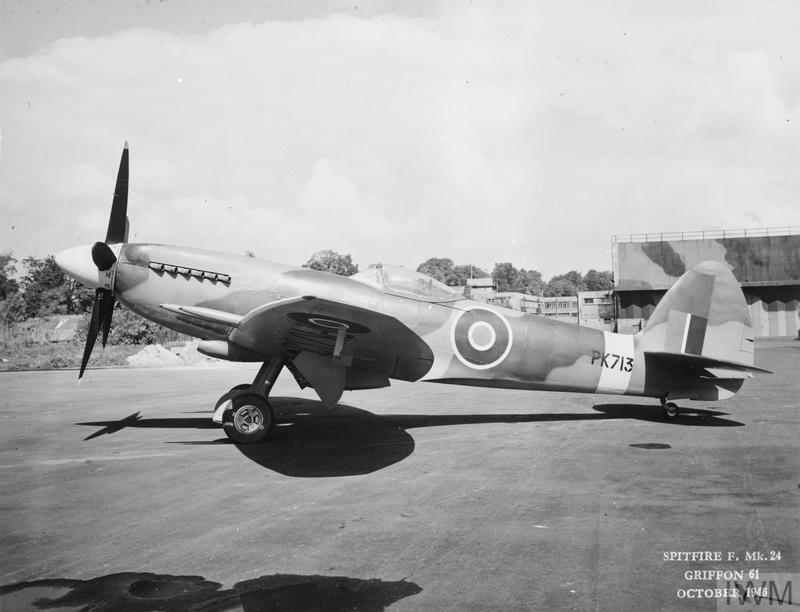 For nearly all aircraft types, the basic handling characteristics are largely concerned with lateral control – and, from this point of view, the Spitfire F.21 was a very different type from earlier Marks. In particular, the natural course of development for higher speeds had made it necessary to introduce geared servo tabs to the ailerons. Pleasantly light though these made them, the ailerons lost their original ‘feel’ and became somehow soulless. As nice as the 21 was, with its taller and wider undercarriage and supremely joyous performance, it had ceased to be a Spitfire. 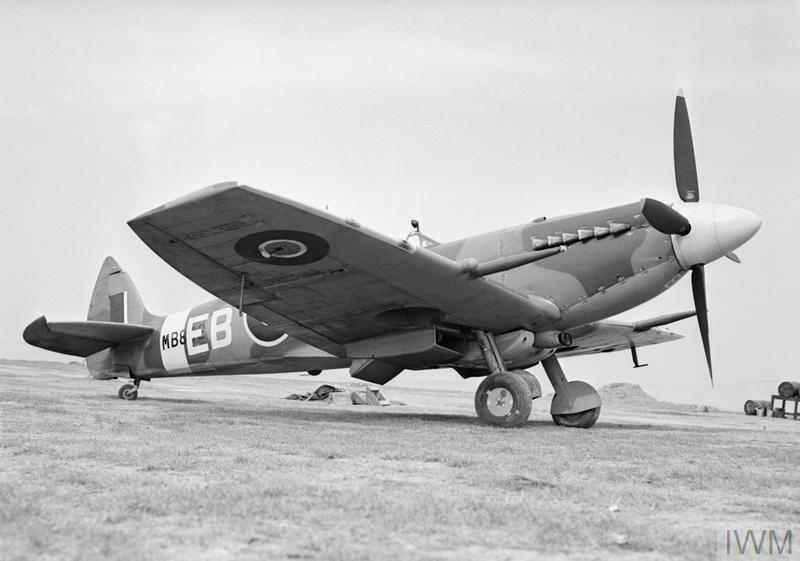 So, while the Spitfire’s layout and general characteristics were slightly but irrevocably altered with the introduction of the Mark XIV, the final loss of that distinctive ‘Spitfireness’ really came long before it’s replacement – the Supermarine Spiteful – entered service. Maybe I’d lived too long on the earlier Marks and was of a naturally conservative nature but, to me, the epitome of Spitfire development came in its middle years. Even such a superb design could, it seems, eventually become over-developed. 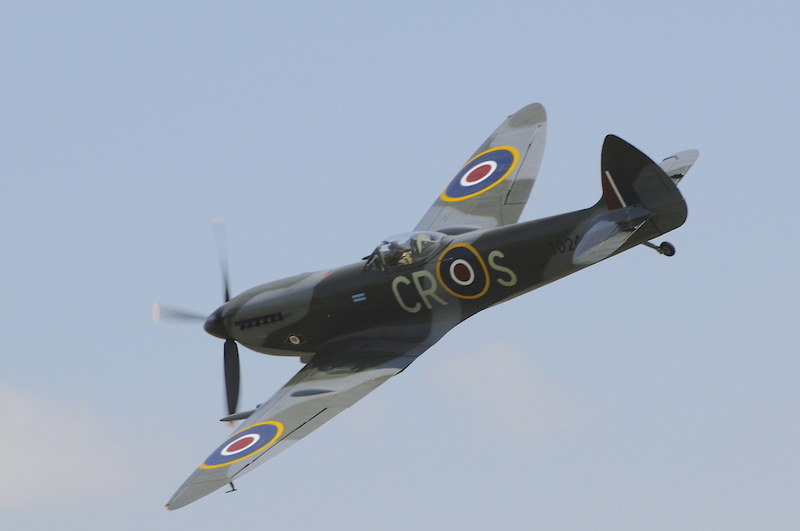 The long Spitfire saga of product development and improvment is one you’ll find all throughout aviation. One of my favorite examples stems from the Spit and directly connects to the present day. I’ve got a post coming up about that, actually. Yes, the Spitfire saga is a wealth of valuable lessons. I’m looking forward to your post. 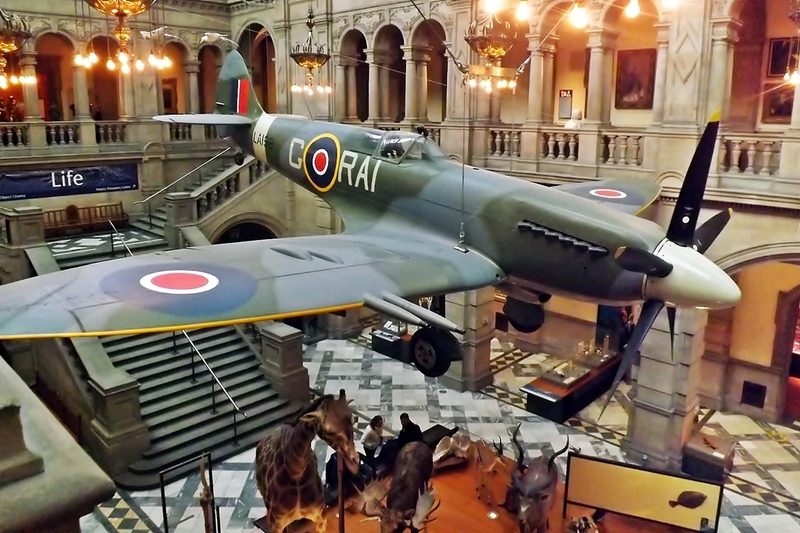 Your research is perfect for my blog about a Spitfire pilot. It has had a long and distinguished career, developed into something quite different to its original spec. What ever guise it is in, it is certainly a thing of beauty and power. I think perhaps it was over engineered at the end, and did reach its full potential. There is only so much you can squeeze out of a design before it starts to suffer. An icon of the skies and one of Britain’s most outstanding examples of engineering, its place in history is well and truly marked. 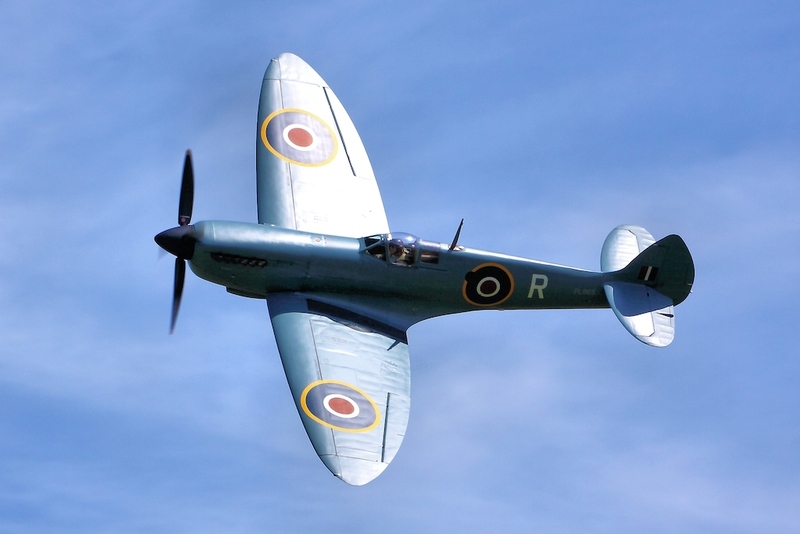 It’s hard to think what to say about the Spitfire that hasn’t been said already… My understanding is that the extent of an aeroplane’s development is a true test of the original concept’s quality – and the Spitfire delivered in spades. It became a question not of how much could be squeezed out of the design, but how much could be squeezed into it. Turning a 1,000HP point defence fighter into a 2,000HP air superiority and strike fighter would test of credulity, let alone engineering. What a legend! It certainly went through a lot and was great at pretty much whatever it was tasked to do. Ooh, playing favourites – you’re on dangerous ground now! I think I’m on record as preferring the Griffon Marks, but it’s a bit like trying to decide at what age you loved your own child the most. And I’ve never been able to to choose between Spitfires and Mustangs. I’m definitely a mustang girl! (I take after Colonel Blakeslee in that respect, I suppose.) But that is a tough question. One to keep you up at night!